Summer mantel stylings over here usually include flowers. It is kind of my thing- and my favorite look. And would you believe that it is the 11th of August... and I have not styled and photographed a summer mantel yet? Seriously. In between renovations, behind the scenes photography work for my book and other things I have been working on... I have not done much more than plop a zinc bucket full of blooms on the mantel and called it good. So today for Friday Favorites- I am sharing 5 of my favorite mantel ideas... and maybe this will inspire me to tackle one for this year to share with you as well. This mantel was so much fun to work on. It was a special project for one of my favorite magazines and it was all about French style and fresh goodness for the mantel. I chose coral peonies and cafe au lait dahlias and an armful of eucalyptus. 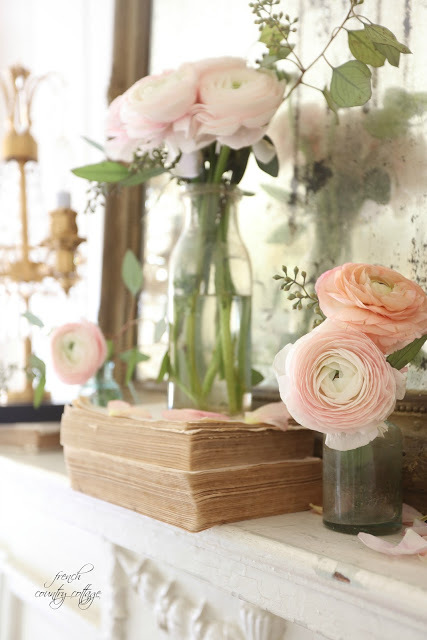 Tip: Creating a fresh flower garland is a fun way to get a different look. I love garlands- and they aren't just for the holidays. Try one for spring or summer with fresh eucalyptus or other greens and add in your favorite flowers for a soft touch. 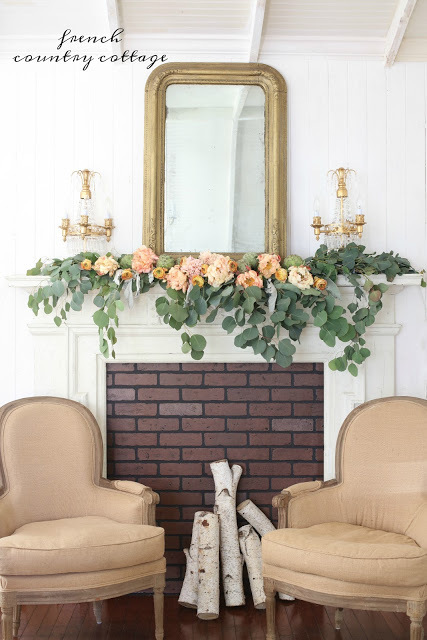 Because simple charm is one of my favorite looks- this simple mantel was styled for a party and with just a few elements - it came together in just a few minutes. Tip: Keep it simple with just a few clear glass bottles and let the overall mantel speak. You don't need a ton of flowers, ton of books or ton of anything else to decorate a mantel. Keep it simple for a quiet look. Because, I love reusing those little soap bottles with pretty labels- and love Larkspur. This mantel was another 5 minute mantel- they are kind of my favorites. 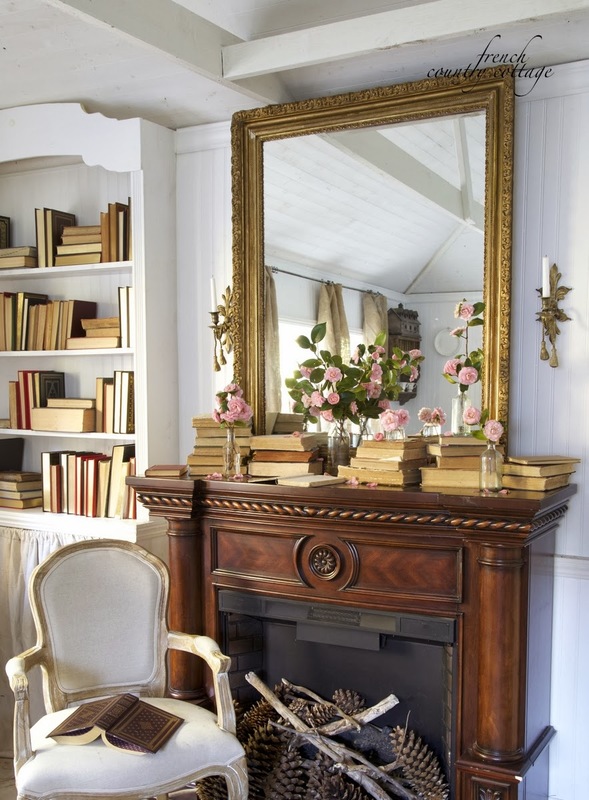 Tip: Laying flowers on the mantel is a perfect way to get a different look. Flowers like larkspur dry well- and are a perfect choice for laying on the mantel to enjoy as they dry. 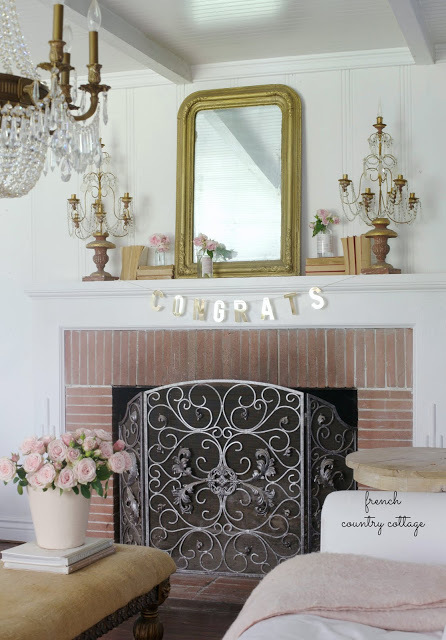 One of my absolute favorites- this mantel out in the cottage was speaking my language. The camellia blooms are from our tree and the books- well, collecting old books is an obsession. 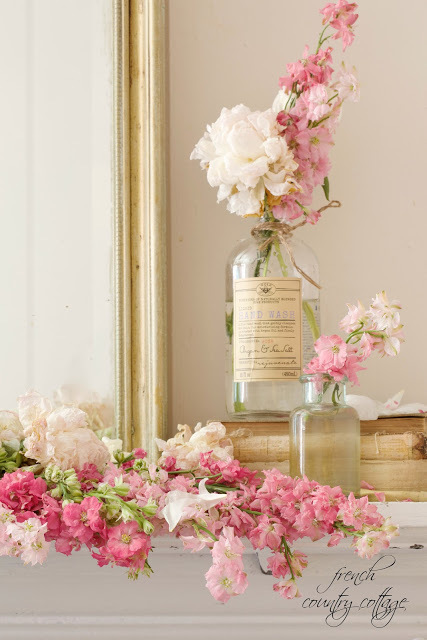 Different size bottles filled with the same flowers is a perfect way to get a charming look. See, I told you about books, bottles and blooms as my go to mantel decor...and it is true. And I could probably keep this list going on how many mantels I have styled with those same elements. This mantel with those apricot and barely blushing blooms mingling with vintage aqua bottles is another of my favorites. Tip: Mix in a bit of gold for a touch of bold. The simple gleam of the gold lamp behind the flowers adds an interesting element and pulls the look together. So there are 5 favorites for summer or anytime of year - using mostly the same elements in each one. What are your favorite mantel styling elements? oh yes, I may be starting to sing Christmas carols already. Before I have even decorated a summer mantel for the year. I just found some (about 200) century-plus old books in a storage unit. Many are paperbacks, and in those days, that meant the covers were just paper, like any other page. At first I thought the covers had been torn off, but no, that's how they were. Anyway, seeing your books makes me feel I can dare to use them, because they are well-worn! Thanks for the inspiration. I love books and flowers on a mantel. Great tips, and so easy. Thanks, Courtney! All so pretty, but I think the last one is my favourite. Great styling, Courtney. Hi Courtney, thank you for all your inspiration! I love your mantels, but thought you should give some credit to the beautiful mirror that is reflecting all the gorgeousness. I've read some say that a mirror doesn't belong over a mantel because of the reflection of the ceiling...... but I couldn't disagree more! Your styling proves that theory wrong as well. Also, I wanted to thank you for the cake styling this week. I live in the Northern California foothills of the Sierra Nevada, so we also have an abundance of blackberries. You inspired me to decorate a cake and to use the budding vines in my floral arrangements this week. Beautiful and delicious! Thank you so much for everything you do. I always love your styling and photography Courtney. You got it goin' on girl! Great tips, love all the ides..
Congratulations Courtney on your new job at Romantic Living Magazine. I know that you will do a great job.